Chelsea Chambers is on her own. 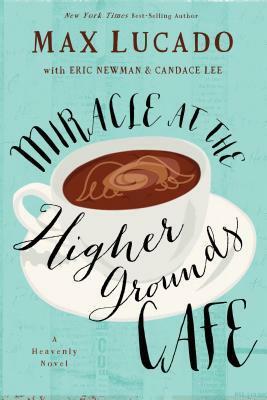 After a public split from her NFL superstar husband, Chelsea takes a bold step out of the limelight and behind the counter of the Higher Grounds Cafe, an old-fashioned coffee shop in dire need of reinvention. But when her courage, expert planning, and out-of-this-world cupcakes fail to pay the bills, this newly single mom finds herself desperate for help. Better yet, a miracle. Then a curious stranger lands at Chelsea's door, and with him, an even more curious string of events. Soon, customers are flocking to the Higher Grounds Cafe, and not just for the cupcakes and cappuccino. They've come for the internet connection to the divine. Now the cafe has become the go-to place for people in search of answers to life's biggest questions. This book is about a mom, who has left her husband after his high profile life as an NFL quarterback has been shown on the internet of his last encounter with a women that was not his wife. She has decided to move back to her home town in Texas and take over her mother’s coffee shop called Higher grounds café. She is dealing with her children that don’t want to be there along with people from town who only want to know want it was like being married to the hottest quarterback in the NFL and from Texas. They meet in college and she never thought her life would be like this. Then she receives notice from the IRS that her mother owes them and she is barely making it as it is. Max Lucado, uses this story and has an angel come down to help her but there is so much more to this story. She is looking for her faith which she has lost, forgiveness of her husband who actually is doing everything to apologize and tell her that he has made the biggest error of his life and is their any way that she could forgive him. Then there is the teenage boy who comes in she talks to and he tell her that his mother is sick. You find out later that she is dying from cancer and she pray is not for herself but for someone to love her son and take him in to a family so he is not running the streets. Once again a mother putting her sons needs before her own. Once Chelsea starts to look at her life and then turn back to the Lord things start to change for her. This is a good story and full of meaning. A good book. I got this book from net galley. I give this 4 stars.